There were recently anti-India protests that took place in Srinagar India. The protests ended in a firefight with government forces in a disputed area. It all left dozens injured and at least one dead. The clashes happened in India-controlled Kashmir, that followed with the killing of a prominent rebel leader. The rebel commander’s associate was also killed in the gun battle. Sabzar Ahmed Bhat and a fellow militant were killed after soldiers cordoned off the Southern Trail after getting a tip that rebels might be hiding in the area. The brutal firefight that left many wounded ended later on Saturday after soldiers recovered the bodies of two people. However, police say they’re searching for at least one more body. 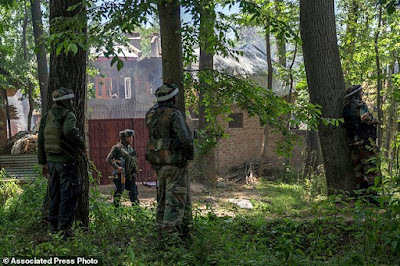 During the intense firefight, hundreds of residents tried to help the trapped rebels get free by shouting anti-India slogans and were also marching in the streets. The protesters were only dispersed after police threw tear gas at them. The protesters were also throwing rocks at soldiers in an attempt to get them to retreat from their positions. It is also said that several people were fired upon by government forces, this is what led to many being injured. Police chief S.P. Vaid that one man was killed by crossfire. Authorities suspended most of the internet services in the area only a day after the month-long ban on social media sites such as Facebook, Twitter went on. The bans that have happened are usually done because of videos of the alleged abuse by government forces, thus people uploaded them to social media sites. In the mostly Muslim area, anti-India ideology runs deep and many people support the rebels’ anti-India fight despite the decade-long military crackdown in the area. The crackdown happened in order to fight the armed rebellion. The rebels have been fighting for their cause of no Indian control in their region since 1989. The rebels would like to have independence or a merger with Pakistan. In the conflict that has led to wars and diplomatic issues in the region. India even claimed Pakistan was arming, training rebel forces in the Pakistan-held part of Kashmir. The two nations (India, Pakistan) have been disputing the territory for a long time and even fought two wars over it. It must also be dearly noted that this is not the first time large-scale protests like this have happened. Last year similar protest began and of course clashed happened then too. That time a lockdown was put into place where at least 90 people were killed and thousands were wounded. The charismatic rebel leader Burhan Wani was killed which is believed to be the cause of the protests.